Johnny Vivash plays Commander Radek the head baddie and evil leader of a group of mercenaries in Finlands first superhero feature film 'Rendel' directed by Jesse Haaja. The dark fantasy action has its Cannes industry screening on Thursday 17th May at 14:00 in Lerins 1, ahead of its national cinema release in Finland this coming September. Directed by Finnish filmmaker Jesse Haaja, a graphic designer now making his feature directorial debut after a short film (called Perfect Fit). Haaja first created the Rendel character 17 years ago when he was a teen. 'Rendel' is a Finnish comic character created by the director Jesse Haaja. A man blinded by vengeance and rage, the name Rendel comes from the Hungarian word for “Order”. A faceless superhero he is at open and ruthless war against the Vala a huge criminal organisation: no mercy, no prisoners. One hit after another, this dark avenger destroys both the criminals and their equipment. Helpless against the guerilla warfare, Vala hires international bounty hunters to strengthen its lines. As the faceless avenger challenges the faceless corporation, both masks begin to crack. Nobody gives way, nobody backs down. It's time for the truth. 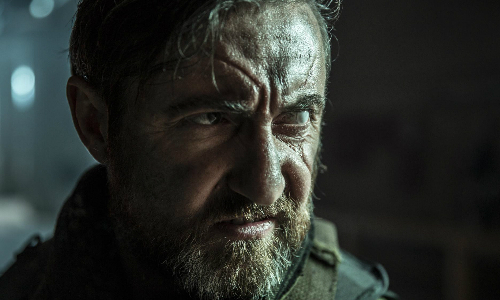 The menacing Commander Radek played by Dublin actor Johnny Vivash makes for an interesting addition to his screen role credits after starring in an array of shorts such as 'Stand Alone', 'When the Sea Gulls', and 'Stranger at the Door' and that's only this years'. Johnny also starred in the 2015 Irish-Belgian short film 'Big Bird' which won him the Best Male Actor award at the Birmingham Film Fest in November 2016. From big birds to action packed Finnish superhero films, IFTN caught up with the Irish actor ahead of the 'Rendel' industry screening in Cannes to ask him a few questions about filming on location in Finland, that terrifically scary looking eye and what projects he's got coming up next. 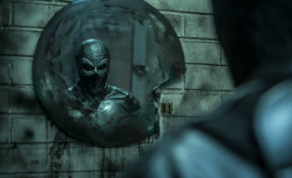 IFTN: What was your experience filming for Rendel in Finland? Johnny: It was amazing, a breathtaking country in all is natural glory, I was based/ Filming in Kajaani about 800km north or Helsinki. Excellent hard working crews and wonderful Finish and international cast! IFTN How does a Dublin guy end up playing a baddie in a Finnish action movie? Johnny: The lead Character Kris Gummerus who plays Rendel performed in a play with me in London (Purge at the Arcola Theatre) a few years ago, we stayed in contact always wanting to work together again because we had a blast during the play. He got in contact with me after the Director Jesse Haaja spotted a photo of me though Kris and after a Skype meeting, the rest was history. IFTN: What did you enjoy most about playing the character? Johnny: Well, I'd be lying if I didn't say a yelped like a school girl when they wanted me to have an eye like Kirk Douglas in Vikings! Commander Radek was superb to play a quintessential superhero villain. IFTN: Did you get to work on any of your own stunts? Johnny: Yes, I wouldn't have it any other way, the Finnish stunt team were amazing! Always keen to add extra flourishes to make the action ultra real. IFTN: What are you hoping the reaction will be to the industry screening in Cannes this week? Johnny: One that will pluck people's interest in this fantastic project and hopefully give it a wider platform outside Finland and the Nordics. IFTN: What's next for Johnny Vivash? Johnny: Feature wise, up next is a brilliant dark psychological horror about a police detective whose sanity begins to unravel as she investigates a series of brutal ritualistic murders. That and a number of shorts that are about to start into their respective festival journeys. 'Rendel' is an action-packed superhero genre film from Finnish production company Black Lion Pictures. It has echoes of 'Spawn', 'Dark Knight' & 'Zoom'. It is still looking for international distribution and doesn't have any release dates outside of Finland (this September).